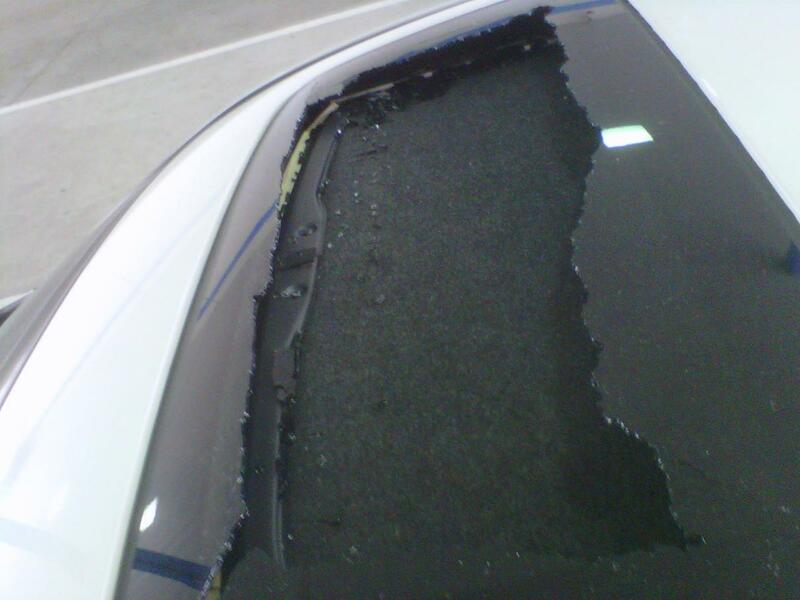 Has anyone had a sunroof explode for no apparent reason? I'm asking because on yesterday I was driving home and all of a sudden I heard a loud boom. I thought someone threw a rock in my back windsheild but I didn't see any damage when I looked. However, when I approached a red light I got out of the car and looked up and saw that the sunroof had shattered in the middle. I immediately looked around to see if anyone was throwing objects and no one was around. I was also in the middle lane and no tree or debris hit it either. It was totally strange. Of course, my first reaction was to call the dealer. Well, after not getting anyone on the phone, I decided to drive to dealer since they were still open. All of the service reps thought this was odd but they taped the damage and advised me to return in the morning to speak with a service manager to see if it would be covered under warranty. Well, the next morning I took the car and the service manager thought it was odd as well. He did agree to have Honda investigate this issue and they put me in a rental vehicle. I'm hoping that all turns out well and that I can avoid using my insurance. I also did several Internet searches and have found other examples of this happening with other cars. I was wondering if any of the new cars experienced this problem as of yet. I have a 08 Accord. I have never heard of this. That is crazy. Let us know how it goes! I smell a recall on the horizon. Unless somehow a rock was launched up in the air and landed on the sunroof, breaking it. But that would be highly unlikely. I've never seen that happen in my 3+ years of insurance claims handling experience. Just wanted to let everyone know that Honda has decided to replace the sunroof glass. I got the call from the service rep this afternoon. I will try to find out on Tuesday when I pick my car up what they think the cause of breakage was. I also wonder if they will even share this information with me especially if it was a defect with the sunroof. That just me being bitter of the lack of performance parts for the 7th gen.
my wife's '10 accord exploded it's sunroof 5 days ago. no trees above, nobody around, parked in the garage all night. She was on the way to work, only a couple of blocks from home. Dealer says something must have hit it(there was nothing). Insurance says they don't cover heat related damage(? they didn't even go to the dealer to look at it and it was still morning, maybe 68). NEITHER IS RELATED TO THIS BREAKAGE! We are now waiting for another week for the regional service mgr to come to town (nobody mentioned a loaner). First foreign car we have ever bought (40 years,20 cars,trucks,jeeps)probably the last. Last edited by g22cd5; 07-24-2010 at 05:04 PM. Great car so far. Eleven months and 9000 miles, it's been great. . .UNTIL NOW. Going 70 on the freeway, my freaking sunroof explodes. No impact, no raining bricks, it just creaks and then explodes. How awesome!!!??? What's even better is the crappy service from your local friendly Honda dealer which automatically assum...es you're a dumbass and that you you're too ignorant to know that a flying missile just exploded your sunroof. . .and it'll be $1100 for the repair. Gee, thanks Goodson Honda Houston! I have heard of this before and most of time it has to deal with the sunroof being tinted too much or has a very highly reflective flim on it and it heats up too much with the sun and just explodes. Its probably very unlikey something hit it. I would have to be coming straight down from the sky to do that. The description of an "explosion" suggests the glass is under substantial compression, hence the noise when stress is relieved. This may be a manufacturiing/assembly issue. Perhaps the side trim pieces are overtightened somehow? Comprehensive insurance might cover this damage.